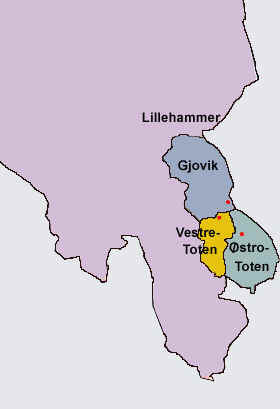 The Toten area is located about 55 miles or 88 Km north of Oslo. However if one is going by car, plan on a two hour drive. Pushing a cart over the mountains might have taken our ancestors several weeks. Toten is in Oppland Fylke, a larger administrative unit with functions of both a county and a state. 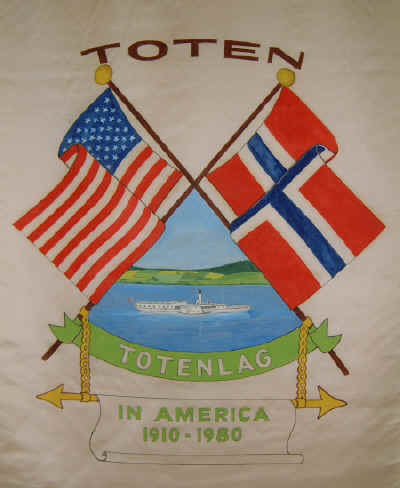 Toten is in the eastern, or flatter part of Norway. It has a lot farm land and higher up on the low mountains (1500 meters), much timber is grown and harvested. Toten's climate is much like southern Minnesota. Rainfall is less than on the west coast of Norway. Viking roots go back about 4000 years and there may even have been people living there soon after the glacier melted. The Pilgrim Way, a route taken by medieval pilgrims travelling from Oslo to Nideros Cathedral in Trondheim where St. Olav's remains were preserved, goes through Østre Toten past the Balke Church and to Gjøvik. The people of Toten may seem reserved at first, but soon warm to visitors just as you would do. They prefer to know someone is coming rather than be surprised when they see guests at the door. Most of the younger people speak some English. If only we spoke as much Norwegian. 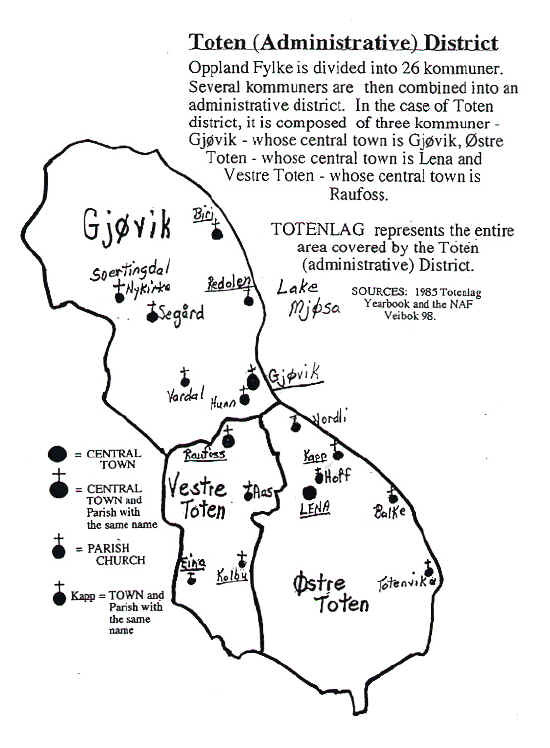 A three day annual Stevne (See Stevne Plans) with other people who came from or are descended from people who came from the Toten area. The Stevne includes fellowship, an opportunity to use the Lag's genealogy materials, programs and entertainment with a Norwegian flair and lots of time to make new friends. As an added bonus you may learn about cousins both in Norway and elsewhere and get valuable tips for visiting Norway from people who have been there. The theme of the stevne this year is "Get Koselig with your Heritage!". Totenlag is in charge of organizing the 2019 Stevne. PLEASE consider helping out with planning or during the event. More information on how you can help can be found on this form. Because Norway has a state church, it has been charged with collecting information (even for members of other religions) for centuries. This information includes some of the same subjects one can find in American Church records-baptisms, confirmations, marriages and deaths. Other information collected only in Norway includes: Small pox vaccination dates, area comings and goings. There are privacy laws in Norway that protect recent information. All older information is transferred to the regional archives and can be viewed there. By the way, grave and grave stones are only allowed to be used for a given number of years. There is not enough land to give each person a permanent resting place so the grave is reused and the stone may be reused unless the remaining family members rent the space longer. Copyright 2006-2014 - Totenlag. All rights reserved.